Noticed this today in Tesco and Sainsbury. £3.25. Has a nice silver poly attached with "limited Edition" Ewer figure. Its also has an offer in Tesco that if you buy it with a copy of the Sun you get the magazine half price. Works out at £2.02 total which is not bad for a minifig! Sweet! Thanks for sharing, this is going to be a reward to myself tomorrow when I hand in my literature review. Cheap 'n cheerful is the best kind! Yes, it's nice. It was on the front page yesterday. Just in case you aren't following the comments on the news story - have a feel of the bag before purchase as some - including the first one I got for my son - have the wrong pieces eg no head, leg, torso, helmet pieces etc! If you can get a complete one - like our second one - it is a nice figure and with the sun deal a pretty decent price particularly if someone in the house will actually read the mag as well. Ive now opened five of these , I have eight heads, 4 legs,1 body, 5 headresses, 6 sets of wings,28 white grips,21 trans blue dots, 6 grey grips, 6 gold canon peices, 2 trans blue wands and 4 shoulder pads. Equals 1 minifig! This is so unusal for Lego that I actually think its funny. We got three of these. All were exactly the same, and had all the correct pieces. It could well be down to the area you live in, and whether people steal parts (although why would they add them?). What were they thinking, putting a resealable bag on a magazine? Why not do CMF style packaging instead. Although the area I got the first one may fall into that 'type' (maybe!) I don't think it had been tampered with in the shop as it wasn't just key pieces missing but extra pieces in there - we had 4 wings and a load of the blue chi tiles for example. And, although the bag is resealable (like you say @CCC what were they thinking?) the way it is taped down as well means you would have to have very special skills to remove the desired parts and replace with others without being noticed, even in a big supermarket. Unless there is a specific demand for the gold blade and silver armour part? I managed it quite easily (on one I had purchased and was at home). Flip the bag right up, and open the seal on the back. 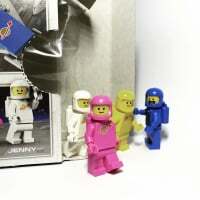 Issue 3 with Grumlo minifig now available.